Colour in these pictures of Thombi and Skalk from the movie Khumba. Colour in these pictures of the characters from Khumba. Click here to view the picture of Thombi and print it out. Click here to view the picture of Skalk the wild dog and print it out. 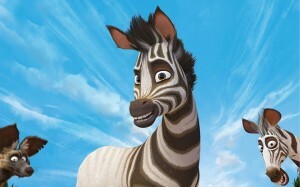 Khumba is a 3D animated movie about a zebra with only half his stripes who is blamed for a sudden drought by his superstitious herd. Produced by local outfit Triggerfish Animation Studios it features the voices of big names such as Laurence Fishburne, Liam Neeson, Richard E Grant and Anna Sophia Robb. It hits cinemas on 25 October 2013 and will be screened in both English and Afrikaans.